In honor of BEDA's Weight Stigma Awareness Week, I thought it would be a good idea to promote as much body positivity as I can this week. 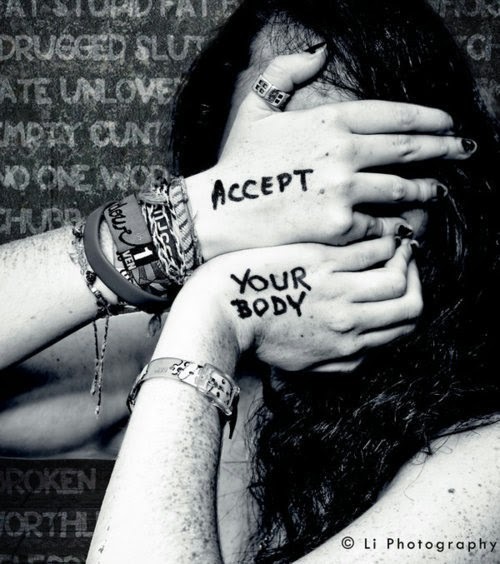 Recently, however, I've been struggling with the whole "love your body" movement. The truth is, some days I just don't love the way my body looks. So, on the days when I don't "love my body" I feel guilty; like I'm doing something wrong when I'm obviously not. 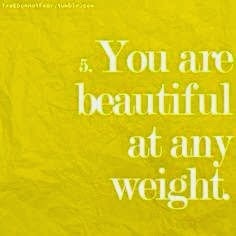 I found this list of "better" body affirmations that I thought was perfect. The idea of becoming comfortable in my body and learning to accept the inevitable changes it will make throughout my life seems more realistic than developing a constant love affair with it. I'm not trying to bash the "love your body" campaign at all because I think it's wonderful. I really do. But for me, at this time in my recovery, I am in a place where acceptance needs to come before love. 7. Take up as much space as you want. You don’t have to be small, or quiet, or docile, regardless of your physical size. 10. Wear whatever you want. Your body shape does not dictate your personal style, and fashion rules that say otherwise are wrong. Dress yourself in a way that makes you feel happy and confident and beautiful, because guess what? You are." I think these 10 "better" affirmations are a perfect way to start my week. Happy Weight Stigma Awareness Week! I struggle so much on this. It does not mean that when I had less weight, I loved my body. But the smaller number made me feel better. Now, the number is not that small (it is still not that big yet), and I now struggle for both my look and the number. I understand that I look better, but then do I love my body in the way it is? I am not a young woman, and my body does not look the same it used to be, no matter what. It is true that the older we get, the more we need to look into something else besides our bodies. I am working on myself to believe that it is not an external thing to define me, it is inside. p.s. a response to your email is coming today! omg i LOVE this the affirmations are truly perfect. you should never feel guitly for feeling a certain way. i read i quote about that once. the rain doesn´t excuse for falling, and you shouldnt excuse for feeling. feelings just are. something like that. I have struggeled a lot with body image last weekend so i kind of started emotional eating and gained even more weight. and then SUDDENLY out of nothing my body image was back to normal again and i felt ok. as you said acceptance before love. i dont feel guilty for not liking my body, but i feel really hypocritical for wanting to lose weight again while trying to convince a friend struggeling with her own eating disorder that shes beautiful even if shes at a higher weight than usual. Yes, logically I know I shouldn't feel guilty for feeling a certain way, but I still do sometimes. Body image will always be a work in progress for me. I think it is for "normal" people though, too. Maybe I just think too much haha.